Hillingdon Canal Club is a minor waterways place minor waterways place place on the waterways major waterways place village town city on the Grand Union Canal (Grand Junction Canal - Main Line - Gayton to Brentford) between Troy Junction Towpath Bridge No 177A (Junction with the private Troy Branch) (4 miles and 5 furlongs and 4 locks to the north) and Cowley Peachey Junction (Junction with Grand Union Slough Branch) (1 mile and 6¼ furlongs and 1 lock to the south). 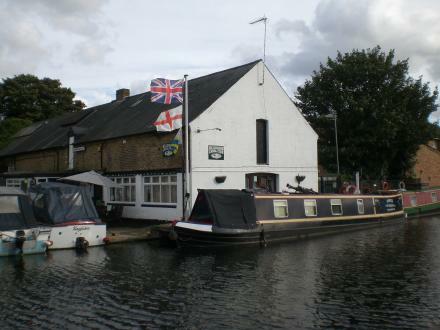 The nearest place in the direction of Troy Junction Towpath Bridge No 177A is Uxbridge Boat Centre; ¼ furlongs away. The nearest place in the direction of Cowley Peachey Junction is Lambourne Court Pipe Bridge; ½ furlongs away. Slough — 1625 yards to the west. Iver Lane, Uxbridge, UB82JD — 1488 yards to the south. St Johns Rd, Uxbridge, UB8 2UR — 96 yards to the north. 54 Windsor Street, Uxbridge, UB8 1AB — 785 yards to the northeast. 30 Windsor Street, Uxbridge, UB81 — 596 yards to the northeast. 222 High Street, Uxbridge, UB8 1LD — 1043 yards to the east. Waterloo Rd, Uxbridge, UB8 2 — 12 yards to the north. Uxbridge, UB81PN — 1412 yards to the northeast. Rockingham Rd, Uxbridge, UB8 2UW — 566 yards to the northeast. Intu Uxbridge, High Street, Uxbridge, UB8 1LB — 944 yards to the east. 28 Bakers Road, Uxbridge, UB8 1RG — 900 yards to the northeast. Uxbridge — 737 yards to the east. Kingston Lane, Uxbridge, UB8 3PH — 1597 yards to the southeast. 106 Oxford Road, Uxbridge, UB8 1NA — 1020 yards to the north. Uxbridge, UB8 1 — 834 yards to the northeast. Hermitage Primary School, Belmont Road, Uxbridge, London, UB8 1RB — 1450 yards to the northeast. Uxbridge — 572 yards to the south. Unit 10 Trade City Business Park, Uxbridge, UB8 2DB — 1605 yards to the northeast. Uxbridge, UB8 1 — 936 yards to the northeast. Phase 500, Riverside Way, Uxbridge, UB8 2UX — 149 yards to the northwest. Buckinghamshire, Slough, SL — 1625 yards to the west. London — 764 yards to the northeast. The Chimes Shopping Centre, High Street, Uxbridge, UB8 1LA — 966 yards to the northeast. Hampton Court 2 Fairfield Road, Uxbridge, London, UB8 1DG — 1359 yards to the northeast. Uxbridge — 1051 yards to the east. Cowley — 1213 yards to the south. hillingdon road, Uxbridge, UB10 0 — 1223 yards to the east. Riverside Way, Uxbridge, Middlesex, Uxbridge, UB8 2YF — 226 yards to the northwest. 8 Union Buildings, Wallingford Road, Uxbridge, UB8 2FR — 839 yards to the south. Regus,Highbridge Industrial Estate,Oxford Road, Uxbridge, UB8 1HR — 600 yards to the north. Station Road, Uxbridge, Uxbridge, UB8 3FG — 1372 yards to the southeast. 1 Rockingham Road, Uxbridge, UB8 2UB — 183 yards to the north. Intu Uxbridge, Uxbridge, UB8 1GE — 1001 yards to the northeast. London — 1410 yards to the north. Abuja, Nigeria, Uxbridge, 234 — 1456 yards to the southeast. Kingston Lane, Uxbridge, UB8 2 — 1612 yards to the southeast. Hamilton Centre, Uxbridge, UB8 3PH — 1456 yards to the southeast. 74 Oxford Road, Uxbridge, UB9 4DN — 1581 yards to the north. Uxbridge — 1248 yards to the south. Uxbridge — 116 yards to the northeast. Uxbridge — 359 yards to the northeast. 302 The Chimes Shopping Centre, Uxbridge, UB8 1GD — 1002 yards to the east. Uxbridge Shopping Centre Mall, Uxbridge, UB8 1 — 897 yards to the northeast.